One of the toughest challenges bird photographers face is obtaining quality images of small birds from robin-sized on down to warblers, chickadees, wrens and hummingbirds. Not only do these species usually appear as diminutive specks in our viewfinders, but keeping them there long enough for a shot or two can be a frustrating experience. Over the years, I have compiled a list of my top ten tricks, most learned the hard way, and remembering them will help your chances of getting frame-filling images of our small and fast avian friends. 1. Know your equipment : Can you switch from AF to MF or Aperture Priority mode to Manual mode without taking the camera body from your face? Learning the controls will save precious seconds and pay off when you finally get a bead on that Yellow Warbler you have been after for months. While he is darting through the trees, switching modes will often ensure correct exposure and ability to focus. Practice in your back yard on stationary objects until you perfect the technique. 2. Observe the surroundings: Take a few minutes, especially when at a new location, to observe the activity around you. What are the birds doing? What are their patterns? Birds are creatures of habit, and if you can learn their habits, you are already halfway there. 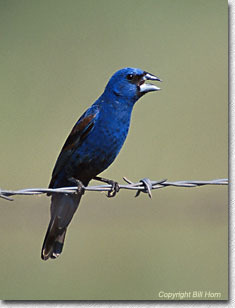 Recently while on an outing near my home, I noticed a Blue Grosbeak singing away on a fence and he kept returning to the same spot. While he flew off, I positioned myself against a small tree less than 15' away. Remaining motionless, I pre-focused my AF 400 Tokina ATX on the spot where he had previously landed. Within minutes he was back, and I got off three quick frames before he flew. 3. Super Tele NOT required: I own and use an AF 600mm F4 a great deal of the time, but a quick check of my stock files reveals 30% of my slides were taken with lenses in the 400mm class. Most were taken using a 300mm w/ 1.4X converter. Here is another fact - I use the 400mm on small birds more than larger species, why? Because it focuses closer and is faster than my 600mm. Don't think by not owning a super-tele, you cannot get good images of small birds. It is a myth. 4. Utilize cover: I hate camouflage blinds, finding them to confining for my purposes. But I nearly always use natural cover to conceal myself whenever possible. By blending in with natural surroundings, remaining quiet and motionless, songbirds will often come within feet of me. I love to find a "birdy' area, settle in and wait for the action to begin. Camouflage clothing is not needed, but don't wear your blaze orange deer hunting vest either. 5. Controlled habitat: By controlled, I mean a small area, such as a back yard feeding station where you control the setup. I have several of these on my property with feeders, water, and other lures to bring the birds to me. Controlling your own setup is probably the fastest, most efficient way to get the birds close to you. Some of them even become almost tame after time. 6. Learn the biology of your subject: Those who know me or have been to one of my workshops know I harp on this one quite a bit. But think about it - would you go fishing for trout with bass bait? No, because trout would be unresponsive. It is the same with birds. Species vary with the season, and bird behavior differs during mating season. Learn migration patterns, and scout locations based on knowledge, rather than guessing. 7. Listen...and memorize: Most small birds have a distinctive song, and they are often heard before seen. Learning the songs of your favorite species will enable you to both locate and identify them. Tapes and CDs are available and can be used to learn them. And during mating season, playing tapes of certain male species will draw other males to you, as they are looking for males invading their territory. You can get very close to the birds, and they are usually in a natural looking environment. They are accustomed to people and will not spook as easily as wild birds. You can experiment with different film/flash combinations, exposure, and composition. 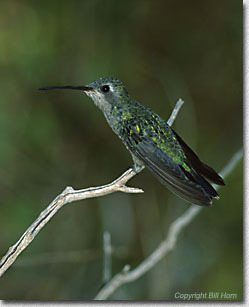 The image of this female Ruby-throated Hummingbird was taken at the Arizona Sonora Desert Museum. The Museum contains a fairly large enclosed area with over 30 Hummingbirds. I used a 300mm lens w/1.4X converter, mixing ambient and flash for exposure. Push Film: Why push film for small birds? Two reasons: small birds are often hidden deep within the forest canopy where light is low. The result is extremely slow shutter speeds which cause blur. I refused to push film for years but finally got tired of the perfectly exposed, well-composed -- blurred images I was getting back from the lab. Secondly, DOF becomes critical with small birds as focusing distance is reduced. This is especially true the longer the lens used. Often one additional F-stop means the difference in having adequate DOF and half the bird blurred due to shallow DOF. 10. Extension Tubes: Last, but far from least is use of extension tubes. Extension tubes are hollow (no glass) and fit between camera body and lens. They decrease the effective MFD, allowing you to fill the frame by getting closer to your subject. They are relatively inexpensive and to work best, need to match the brand of lens and body used. Depending on brand, AF is sometimes lost, but the trade-off is worth it when the slides come back!